Arboreal tanks are prefferred, perhaps of the 20 gallon size. Spray their habitat with distilled water once a day and keep the temp around 76 degrees F. They also love moss. These frogs are known to hibernate. Bloodworms, Fruitflies, small crickets, aphids. Other treats include whiteworm colonies, ants from the backyard, and mealworms. The male's whistling call can be heard throughout the year. This frog produces a loud mating call which is a cricket-like trilled creak or whistle. Information on the longevity of frogs is available in the Weird Frog Facts section. 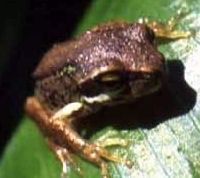 The Whistling Tree frog is one of the new Zealand frogs. It is found in a variety of habitats including coastal swamps, lagoons and dry and wet forests. At breeding time they gather around dams, ponds, creeks and waterholes. It can also be found in Austrailia. Photo courtesy of University of Otago, Department of Zoology. Southern Brown (EWING'S) Tree Frog Victorian (Australia) frog group's info page. for providing information. Robbie sais he has good knowledge of New Zealand frogs and would be pleased to answer any questions you may have.